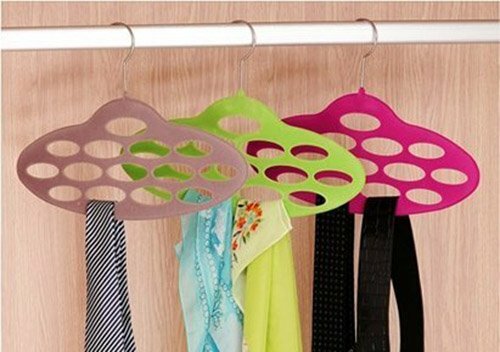 Scarf/Tie Holder Just $3.89 + FREE Shipping! You are here: Home / Great Deals / Amazon Deals / Scarf/Tie Holder Just $3.89 + FREE Shipping! If you’ve been looking for a way to store your scarves or your husband’s ties, I have just the thing for you! Right now, you can get this Scarf/Tie Holder for just $3.99 + FREE shipping! I really need something like this for my scarves (and for my husband’s ties – we just hang them over the closet bar right now)! I love that it can hang in the closet and not take up much room! Porous design, can hold more neckties and scarves and make your chest clean and tidy. Hook can rotate freely at 360 degree, so it’s convenient and easy to use. Bend at both ends, keep your clothes off deformation effectively. Beautiful and high-grade, great for chest decoration. Use these delicate scarf holders, you will have a perfect space.